Board Game Review: Copycat | Action Points! Copycat or Fremde Federn, in keeping with Herr Friese’s tradition of having his game names start with the letter F, is a strange little chimaera of a game. (An aside on Friedemann Friese: He’s one of my favourite personalities in the world of board game design. He definitely cultivates a brand for himself. Look out for games with alliterative titles, the letter F, and prominently featuring green somewhere on the box. You can also read about his Freitag Project here.) It bold-facedly borrows from a number of notable board games and mashes up the mechanics into a single neat package. The games and designers that have been borrowed from are even duly acknowledged in the rulebook. The main mechanic that drives the game is a mix of deck building and worker placement. Each player starts with a deck of 10 cards, 7 of which provide money to buy other cards and 3 cards that generate victory points (sounding familiar yet?). Every player also gets a number of workers that can be used to activate certain spaces on the board. Like in Caylus and Agricola, placing a worker on a space denies that space to other players. The actions from the spaces complement the actions from the cards by letting you draw more cards, gain more money, trash cards from your hand, and double the effectiveness of your cards. More importantly, you need to activate the appropriate space to buy cards. Some action spaces activate immediately, usually the ones that net you more cards. You can also play certain action cards during the worker phase to let you take more actions or draw more cards. The number of available action spaces also increase and improve as the game progresses, similar to Agricola. 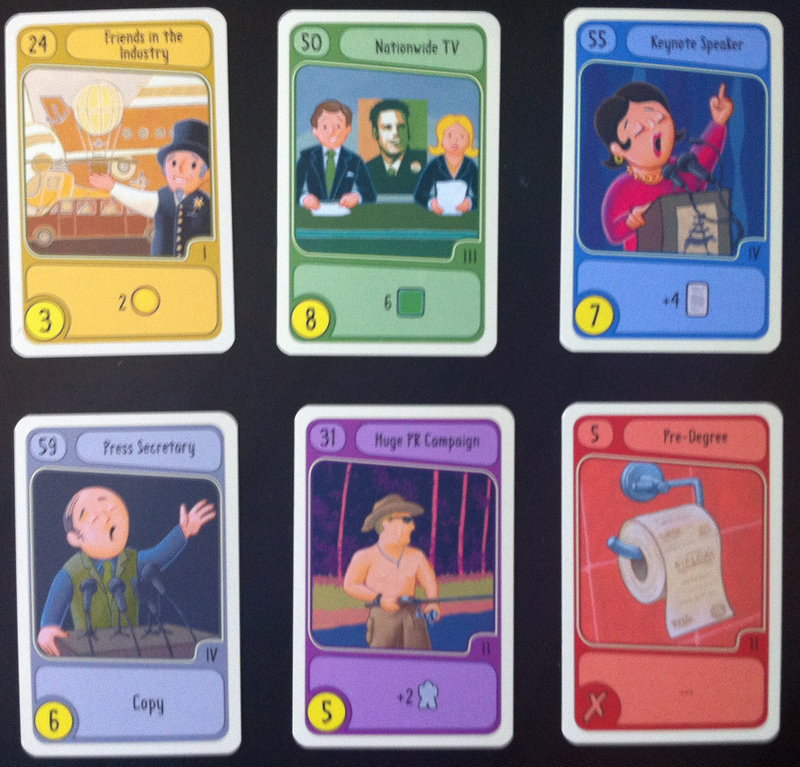 Once players are done using their worker, you move to the card buying phase. Unselected action spaces are seeded with victory point chips which increase their appeal in following turns, reminiscent of the coins being added to the unselected roles in Puerto Rico. You can only buy cards if you take the relevant action space during the worker phase, and the number of cards you can buy are determined by the type of action you took. At this point, you also activate all the action spaces you chose that provides money or victory points. You buy cards from a card row with increasing additional costs as you move up the row, which is the same deal as Through the Ages. The cards that you buy go into your discard pile and eventually make their way back into your deck and hand, a la Dominion. You repeat this process to get better cards, more money, and more victory points until either a victory point milestone is reached, or one of the game timers activates. The other two timers are the action spaces and buying the last special cards from the card deck. So. Now you know how the game works, and you can clearly trace each mechanic to its source, which is pretty cool in its own way. But how does it play? The mechanics are really streamlined and each interacts with the other mechanics in really interesting ways. While the game incorporates some minor elements from Puerto Rico and Through the Ages, the main heart of the game lies in its mashup of deck building with worker placement. I really enjoy how the two mechanics interact. Some cards help you activate more actions, and some actions let you boost the power of your cards. It all works together pretty well, like a well-oiled machine. I really like the mechanics and you really feel like you’re building a point engine that improves substantially over time. However, like a machine, it can feel a little soulless at times. 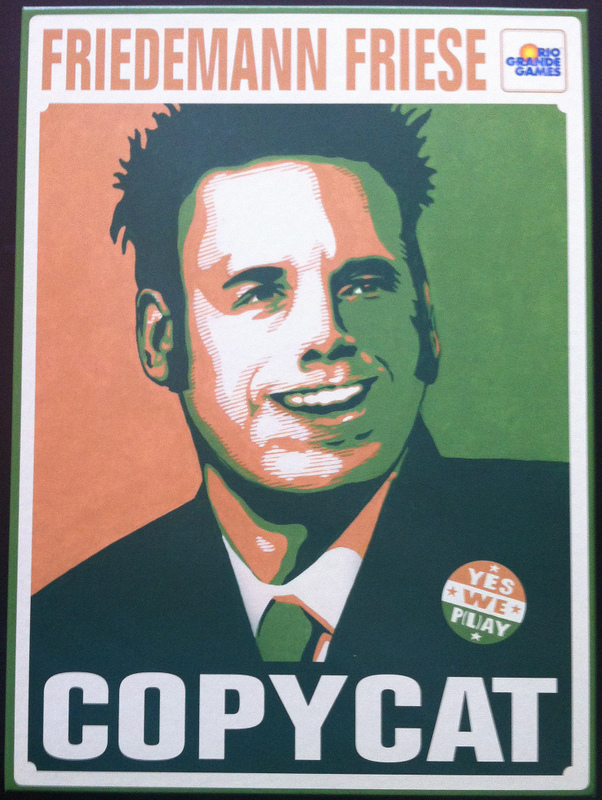 The theme is pretty forgettable and I’d really struggle to sell this game on its theme (it’s supposed to be about campaigning for political office, maybe?). It’s very clear that this game was designed “mechanics-first” and the theme is not integrated into the gameplay. If you’re someone who values theme in a game, this is not one I’d recommend. 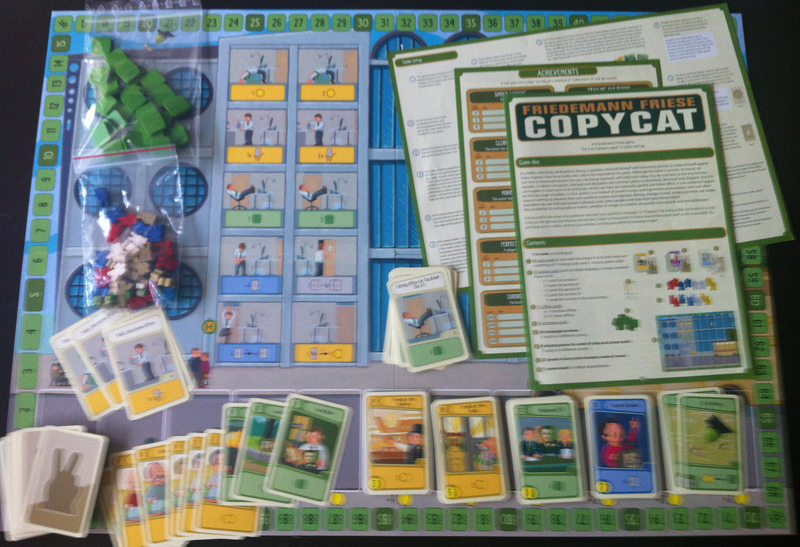 If you like the craft and theory behind the design of board games, Copycat is an interesting example of synthesis and combining different mechanics in an elegant manner. There’s a sort of elegance to the design that speaks to me, and I do enjoy putting the pieces together and building the best engine I can when I play. I think with a bit more effort in integrating some sort of theme, this could be a much more widely enjoyable game. I really like the combination of deck building with worker placement, and I’d love to see it used in a more integrated way and explore the design space more. There’s also another little mechanic in using the numbers on the cards to bid for turn order which I really enjoyed, and could add another dimension by allowing more alternate uses for cards. However, there’s also something to be said for the almost tongue-in-cheek manner in which it embraces its ties to other games, and the meta-joke of naming this game “Copycat”. It’s a game that really speaks more to an entrenched board game fan. Overall, it’s a good game with some great mechanics but it’s not really for everyone, especially those who value theme. Give it a try, and if you enjoy the mechanics, you probably should check out some of its illustrious predecessors. I give it 3 out of 5 green victory point chips.